← Is Being a Naysayer Hurting Your Chance at Better? My family took me out to for dinner for my birthday last night (it was a week later than my day since our schedule hasn’t really allowed for it any sooner). We went to one of our favorite places in town to try the pizza we’d been threatening to try for a while. We don’t go out very often. When we do it usually involves special occasions for us. We shared a really nice large salad and the pizza that we’ve been meaning to check out for a while. It was good. It was lovely to be treated to a night off from the kitchen by my husband and my boys. As we were leaving the restaurant it hit me. This frugal life has killed pretty much all restaurant pizza for me! It was good. It wasn’t great. It didn’t hold a candle to my homemade pizza at home, which, frankly is super easy to make and really inexpensive. I’m not sure how I feel about this! I’m now too aware of how much money we spend on restaurant pizza that is a far lesser quality than what I can produce in my own kitchen. Our pizza adventures began back when my husband left the military. In spite of all our planning, saving, and preparing, we still experienced five full months of being without an income and living off of our savings. It was a trying time and it pushed my frugal living skills to a whole new level. One night, a couple of weeks into his unemployment, our oldest son said “Mom, can we please, please have pizza? Just once? It’s been a long time.” It broke my heart to have him missing such a simple delight. It was very difficult for him to understand our financial situation since he was only four at the time. I decided to make it into a fun DIY project for us. 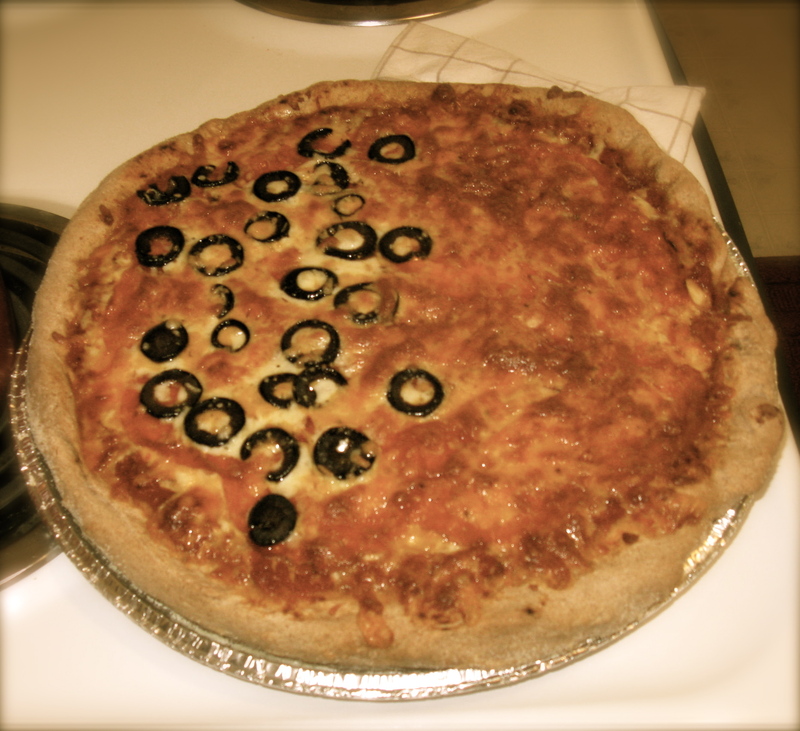 With a little quick online research I found a great recipe for dough and pizza sauce. We were on our way. As we measured and stirred our recipes I kept telling him how this probably wouldn’t taste like “real” pizza from a restaurant, that the important thing is how much we were having fun doing it. When it came out of the oven and onto the table, each of us bit in. We all looked up to see a look of pleasant surprise on each others faces. This wasn’t just good. This was better than restaurant pizza. Why the heck had we never tried this before? And it was so easy (granted, I own an old Kitchen Aid mixer and this helps-but really-I’d probably still do it if I didn’t have one). These days I’ve perfected my sauce to our preference by tweaking the recipes here and there. I’ve also graduated to making a double batch of dough and sauce so I can freeze one set. This give us a super easy Friday night pizza on occasion since the work is mostly done. So, while we had a lovely night out to dinner last night and enjoyed our meal a great deal, I’ve realized our frugal life has changed our enjoyment of pizza permanently. I’ve realized I’ve ruined us for restaurant pizza for good. We all got in the car and heartily agreed on one point: Moms’ is better. If you’ve never tried homemade pizza before, trust me. Try it. It’s fantastic. You don’t need to go out and buy a pizza pan or stone-just use an old cookie sheet for now. It’ll work fine. Be warned though: this might just ruin restaurant pizza for you too. The Cheese: We hand grate ours and use a combination of 2/3 mozzarella and 1/3 cheddar. I get a pound block of each and then just eyeball it to suit us. Once you’ve grated your cheese add in 1 tsp of dried Italian Herbs. It’s much better this way. Toppings: This is up to you! Go for it! Our first homemade pizza. We've come a long way since then! Posted in Practical Things and tagged DIY, from scratch, frugal, recipes. Bookmark the permalink. I learned home made pizza because we missed good tasting pizza in England. (have you tried corn on your pizza) I’m not the best with yeast, so we have mixed results. I’ll definately try the homemade sauce, because I have been trying to find a good one. TOO FUNNY! Landon & I were JUST talking about this the other day. He asked me if it would be too early to make homemade pizza for Austin. Given the fact that he has texture issues & isn’t eating “adult” foods yet, I’d say we have to wait a bit, but we made our first homemade pizza right after getting married in 2001. We cheated though & bought the pre-made dough & sauce but you’re absolutely right…it is so much better. About a year ago when times were REALLY tough for us (after selling our business due to the economy…we didn’t make a profit, but realized a $400K loss), we wanted to go out for pizza but really couldn’t afford it. When I was growing up my dad & step-mom had to feed 4 kids on a budget so homemade pizza was a once a month deal. I called my step-mom & got the recipe & I decided to be frugal & made pizza from scratch for not only us but my in-laws. I made two batches of dough & put out a bunch of ingredients that were in our fridge & cupboards for the toppings. Landon got to choose the toppings for his 1/2 of the pizza & I got to choose the toppings for my half. After we ate dinner we realized that homemade pizza is FAR BETTER than store bought & restaurant pizza! I honestly can’t wait for the day when I get to teach Austin how to make his own pizza & have him enjoy every bite of his own creation! Glad you are having fun making your own pizza! Glad you had a DECENT birthday dinner too! I LOVE YOUR BLOGS! I’m reading to Landon now too & he is enjoying them as well. You should create a Facebook page for your blog to gather more subscribers!